Cowshed Falls is a picturesque waterfall in Fillmore Glen State Park, NY. 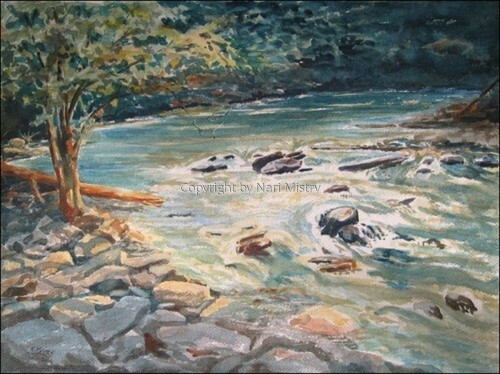 This plein air painting, started on site, was finished in my studio. There was only a trickle of water when I painted it. I had to 'create' abundant water based on photos of the way in which it fell around boulders! It is said that cattle used to walk up the glen in hot weather to shelter in the cool shadows under the overhanging ledge -- hence "Cowshed." Watercolor on archival paper. Archival prints available on request. 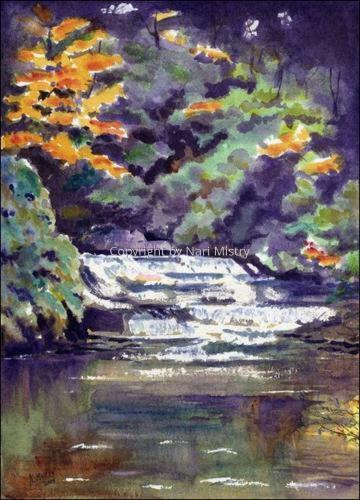 Fall Creek in Ithaca presents an unending opportunity for painting in every season. 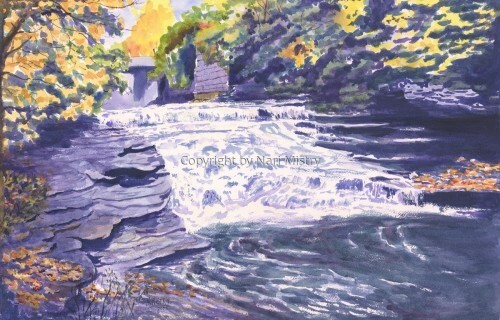 This is my most recent watercolor of Fall Creek in full blazing Fall colors. It started out as a plein-air painting in October when I stood uncomfortably for two hours on the sloping bank to get the best viewpoint in the best light. Eventually the work was completed in my studio. 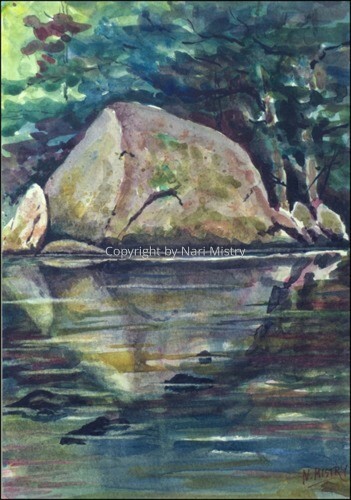 Harrisville is a picturesque village in New Hampshire and its pond is a favorite subject. 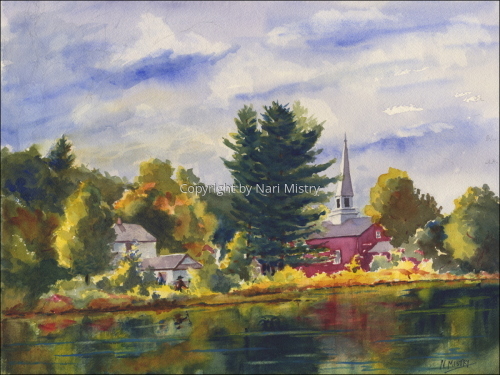 This plein air watercolor shows the tranquil beauty with the village church reflected in the still water. Watercolor on archival watercolor paper. Archival prints available on request. 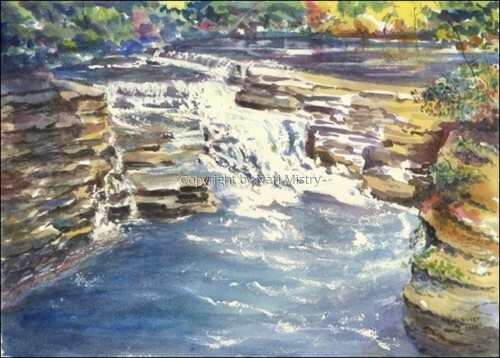 Stewart Park in Ithaca, NY is at the south end of Cayuga Lake and this plein air watercolor shows a view across Fall Creek which flows into the lake at the edge of the Park. A lone rower sculls towards the bridge. Watercolor on archival watercolor paper. Prints available on request. Nubanusit Brook in Nelson, NH is a lovely stream flowing out from Nubanusit Lake winding through farm, meadow and marshland to other ponds. 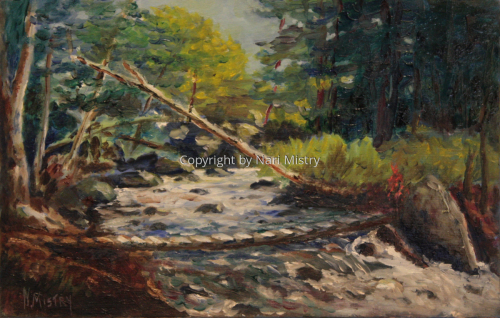 This is a plein air oil painting done on the spot one morning in August. A few finishing touches were added when the paint was dry enough to take details like the red Cardinal Flowers. This is a quiet beautiful spot hidden in Cascadilla Creek gorge just below the Cornell campus, near Ithaca. 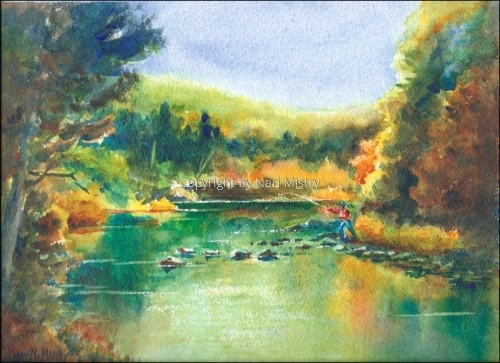 This watercolor was painted en plein air on the spot. Back in the studio I added some of the darkest areas to generate focus. Watercolor on Arches paper. Archival Giclee prints available. Ludlowville Falls is a favorite salmon fishing spot on Salmon creek near Ithaca. 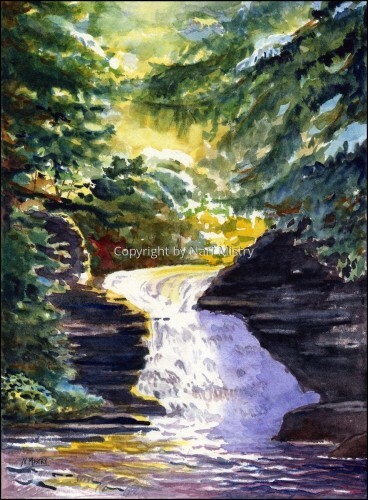 This watercolor is my second more expressionist rendition of the same waterfalls I painted in oils earlier. This was painted en plein air on the spot. 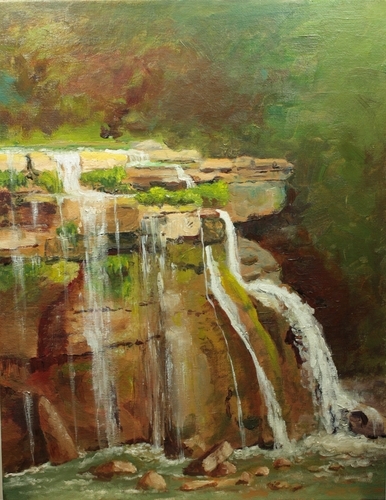 Back in the studio I added the overall shadow to bring out the curving contour of the foreground rock ledges and accented the jutting far ledge to add focus. 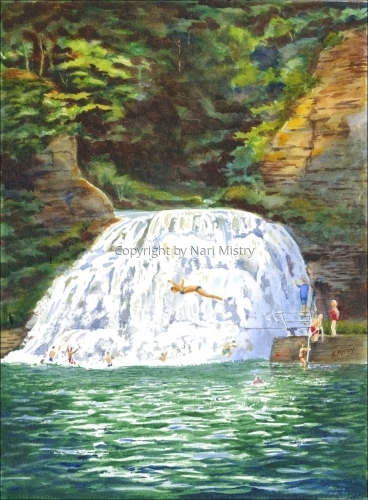 Enfield Falls in Treman Park is one of the landmark natural areas in Ithaca, a popular place for swimming and hiking. 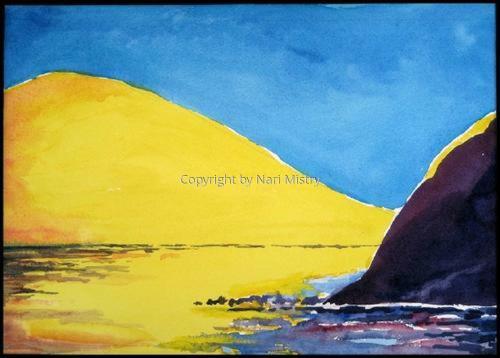 Watercolor on archival paper.Archival Giclée prints available. Taughannock Falls blazing in Fall colors is a sight to behold. It is the tallest waterfalls in the Eastern US, in Taughannock Park near Ithaca. The falls is at the head of a deep winding gorge, carved over the eons by Taughannock Creek flowing into Cayuga Lake. Acrylic on canvas, framed in a walnut frame. Archival Giclee prints available on canvas or paper. Taughannock Park is right on the west shore of Cayuga Lake, and site of Taughannock Falls and gorge. I painted this plein air painting in late June, and added just the dark accents and the foreground shadow in the studio, to enhance the focus on the bridge. Watercolor on arches paper. Archival Giclee prints available. Boats at Treman Marina on Cayuga Lake in Ithaca, NY. 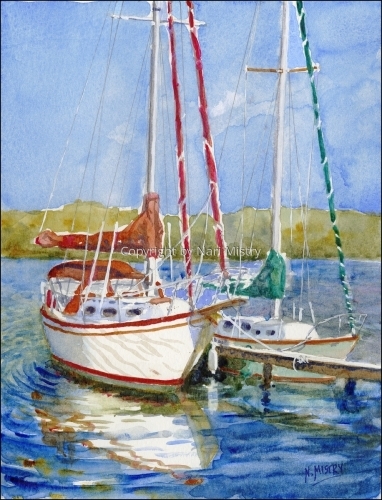 This plein-aire painting shows sailboats and cruisers moored at the marina, at the entrance to the lake. 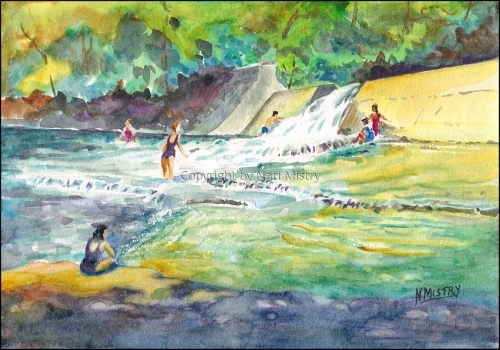 Flat Rock, on Fall Creek in Ithaca, is a wonderful place for children & families to play & splash & slide around in cool flowing water, perfect for hot days. 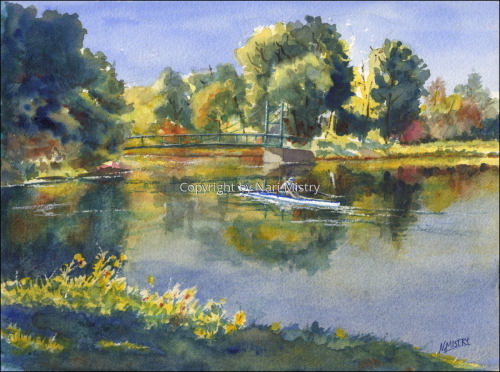 This is a plein air watercolor done quickly on a hot day, with shadows and darks added later at home. 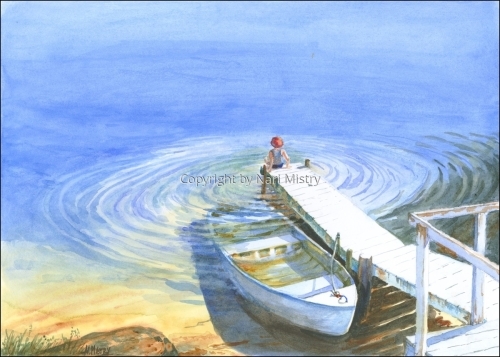 Summer Dreams is a nostalgic painting of a small child splashing her feet making ripples in a still lake, a typical lazy lakeside afternoon. I saw the beauty in this scene and ran for my camera. The painting had to come later. Sloops moored along the Inlet of Cayuga Lake. 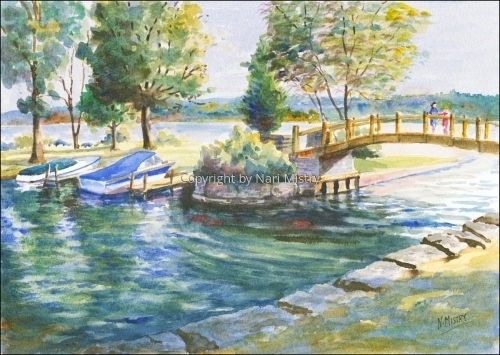 While painting this plein-air watercolor, I met the owners of the "The Packet Inn", the boat on the left. The boat will be sailing in the Caribbean this October (2010). Watercolor on archival paper. Archival Giclée prints available. A brilliant glowing sunrise at Granite Lake in New Hampshire. 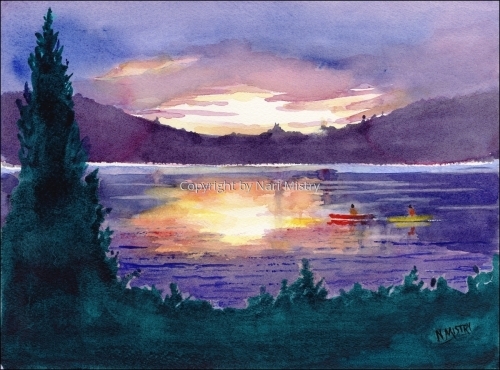 This watercolor was finished soon after sunrise at the lake where we spend a week every year.Watercolor on archival paper. Archival Giclée prints available. Caribbean Beach, Costa Rica is an expressionist landscape/seascape in brilliant acrylic colors, showing the contrast between the riotous colors of the tropical forest and the beautiful calming blue and blue-green waters. The deep blue sky is accented by slashing white "rays" which give a feeling for the brilliance of the sky. Acrylic on canvas, in a floater frame. Prints available on request. 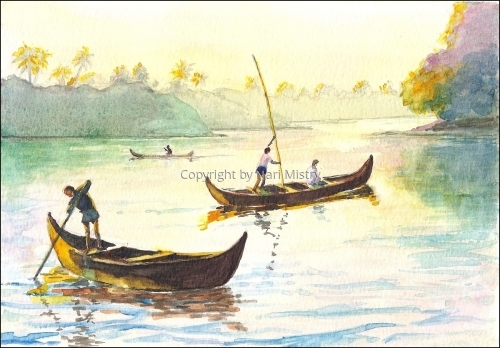 Early morning scene on the river in Kerala, South India. 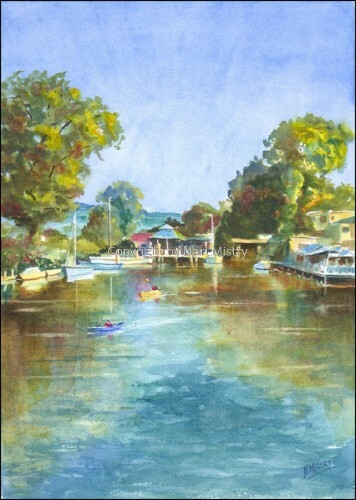 Village life centers on the quiet waterways in the "Backwaters". This is a system of waterways in the south of India, with villages, schools, historic estates and resorts all connected only by canals and rivers. This scene was observed during a visit in January 2009. Watercolor on archival paper. Archival Giclee prints & Notecards available. 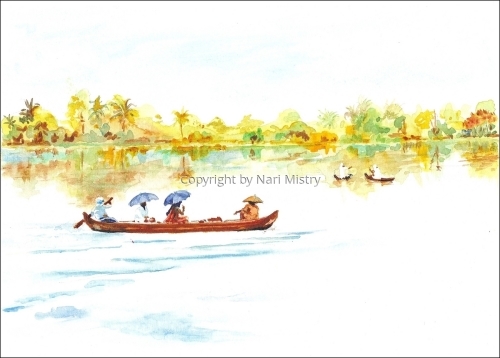 A quiet scene on the river in the Kerala backwaters. This is a system of waterways in the south of India, with villages, schools, historic estates and resorts all connected only by canals and rivers. This scene was observed during a visit in January 2009. 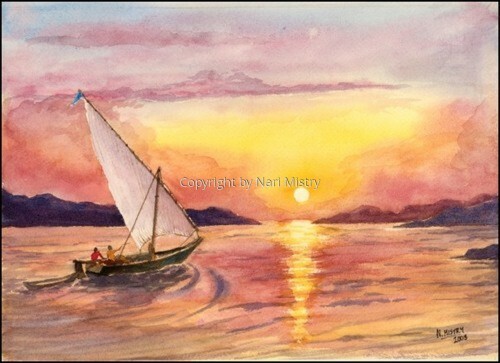 Watercolor on archival paper.Archival Giclee prints & Notecards available. 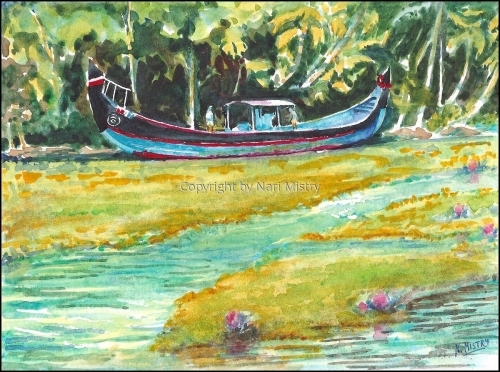 A large blue wooden boat moored in the Kerala backwaters. This is a system of waterways in the south of India, with villages, schools, historic estates and resorts all connected only by canals and rivers. This scene was observed during a visit in January 2009. 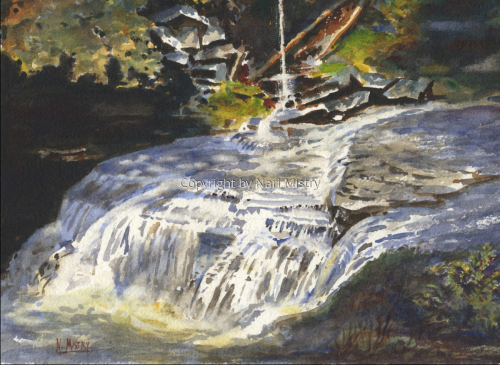 Ludlowville Falls on Salmon Creek near Ithaca is a favorite fishing spot in the Spring.This plein air oil-painting was done mostly on the spot until the skies opened up and I had to run to my car with water streaming down the painting! Oil on canvas board, framed. The original is sold, but a Giclee print may be ordered. This waterfall hides behind the Old Mill at Upper Treman Park in Enfield, Ithaca. The stream is the Fish Kill (or Fish Brook)which joins with Enfield Creek and flows down over Lucifer Falls in the Enfield gorge. 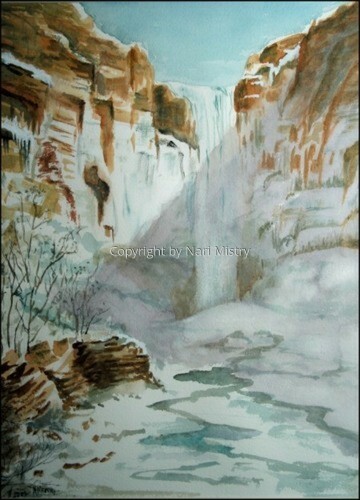 Watercolor on arches paper (2008). Archival Giclee prints and Notecards available. Lick Brook is a lesser known gorge near Ithaca, with deep woods, waterfalls and beautiful quiet spots like this one. 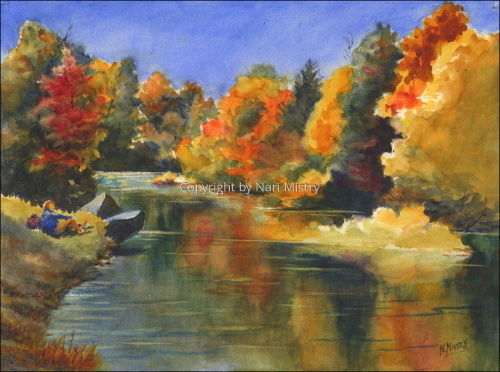 Plein air watercolor (2008) on archival paper. 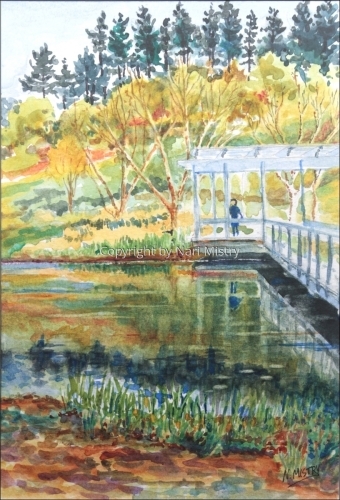 Houston Pond is a central feature of the Cornell Plantations Newman Arboretum.A plein air watercolor, almost completed just before the rain started. It had to be finished at home. 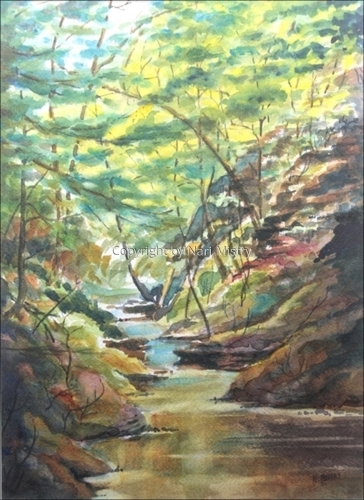 Buttermilk Creek is the source of Buttermilk Falls, one of Ithaca's favorite swimming areas.This is another plein air watercolor done on a quiet summer morning. 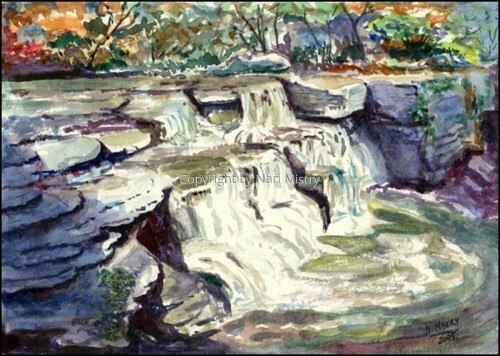 Fall Creek is a prominent landscape feature in Ithaca, and is a frequent subject of my paintings. 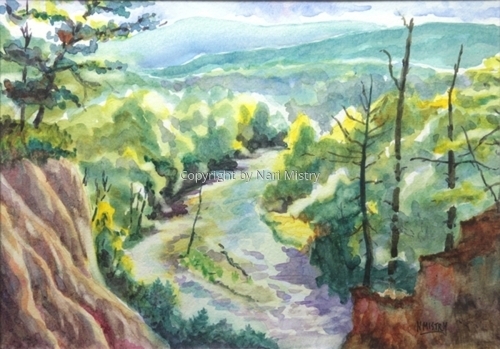 This is a recent plein air watercolor painting done while I was perched on a crumbling cliff above the creek. Fall Creek further upstream. 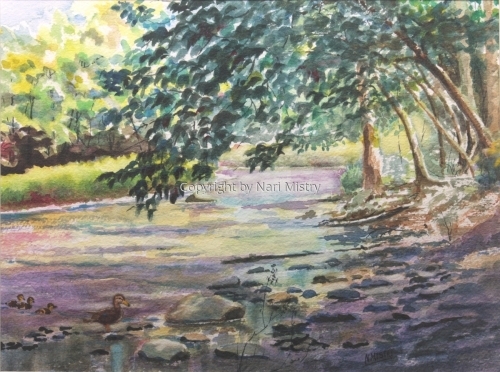 Another view of a favorite scene, a plein air watercolor done on a summer morning with only the duck family for company. 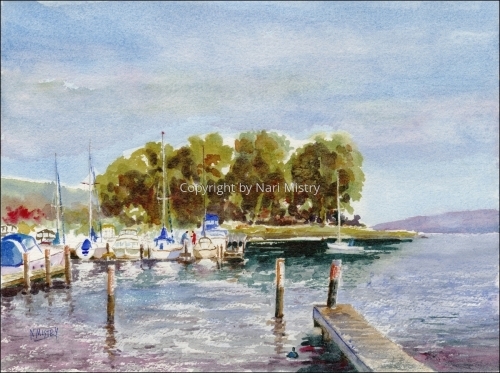 "Along Cayuga Inlet" shows the placid waters along the inlet of Cayuga Lake, one of the picturesque Finger Lakes of New York State. Two colorful kayaks explore the channel. Watercolor on archival watercolor paper. 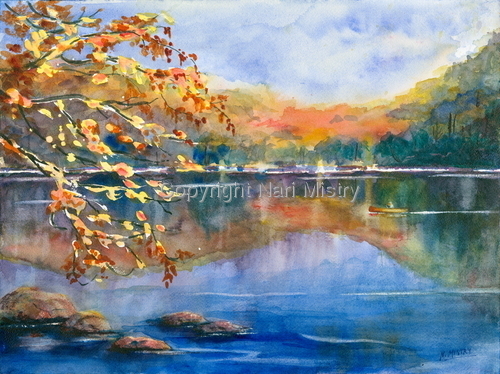 The original is sold, but Archival Giclee prints & Notecards are available. A massive granite boulder on Granite Lake in New Hampsire. The boulder is reflected in the deep dark waters. 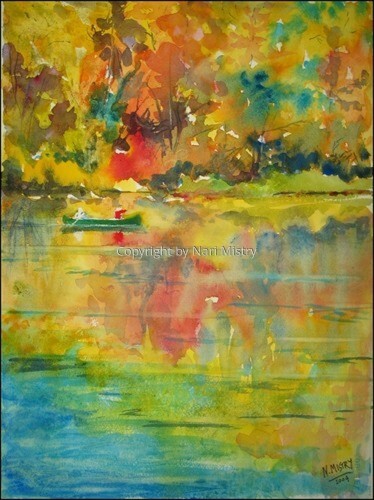 I viewed this from a canoe and then paddled back to our cabin to paint from memory. Watercolor (2007) on archival watercolor paper. "Skull Island, Granite Lake, NH"
The beautiful waters of Granite Lake in New Hampshire, viewed from tiny Skull Island, really just a massive granite outcrop where evergreens and brush have taken hold. 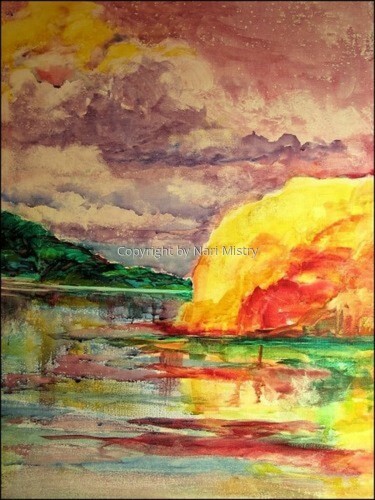 Watercolor painting (2007) on archival watercolor paper. Vermont. 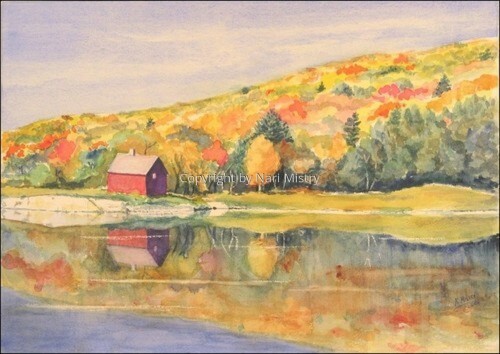 A bright October morning, a typical Fall Vermont landscape with brilliant fall foliage reflecting in a mirror-smooth pond near Warren, Vermont. It had rained all week and I had just one morning to capture this sunlit scene! Watercolor (2006) on archival watercolor paper. The original is sold, but prints may be ordered. Notecards available. Taughannock Falls, a free rendition of one of the very impressive high waterfalls in Ithaca, in the middle of winter. In the collection of the Talman family. Watercolor (2003) on archival watercolor paper. The original is sold, but Archival Giclee prints and Notecards are available. Beebe Lake blazes with Fall colors. This is a favorite location on the Cornell campus in all seasons. Watercolor (2004) on archival watercolor paper. 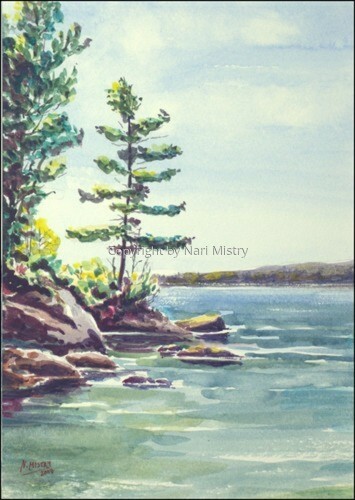 The original is sold, but Archival Giclee prints and Notecards are available. Fall colors on Beebe Lake, on the Cornell campus. This is a typical glorious blaze of color in the Fall, with migrating birds lending additonal interest. Watercolor on archival paper (2004). 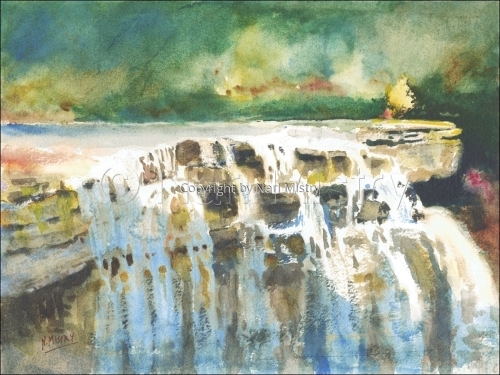 The original is sold, but archival Giclee prints and notecards are available. Watercolor (2005) on archival watercolor paper. This is one of Ithaca's hidden waterfalls, right next to a main highway. Watercolor (2005) on archival watercolor paper. Fullsize archival Giclee prints and Notecards available. Fall Creek flows through Tompkins County giving much of the character to the landscape around Ithaca. 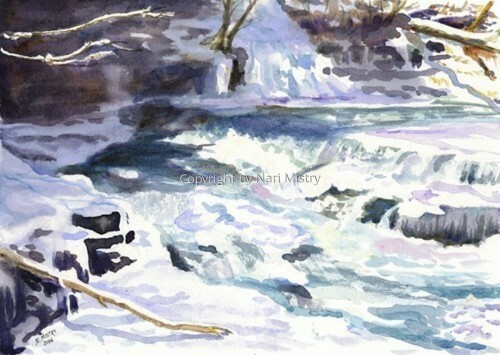 The same falls above Beebe Lake are seen in winter in another painting (see image). Watercolor (2005) on archival watercolor paper. 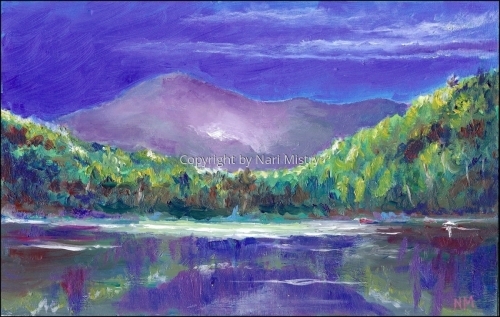 The original is sold, but high quality archival Giclee prints and notecards available. Six Mile Creek, one of the many beautiful scenic features of Ithaca, New York. This is a favorite walk along the Mulholland Wildflower Preserve bordering the creek. Watercolor on archival paper(2006). Notecards available. 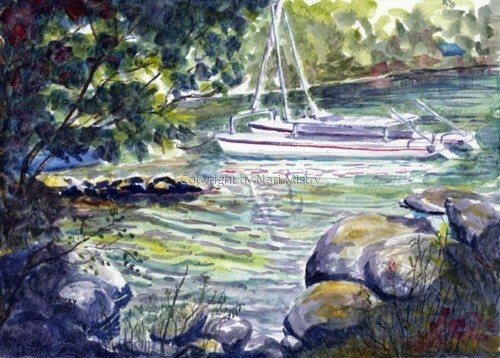 Watercolor (2004) on paper-backed canvas. This is pure fantasy, a vision in transparent luminous color. Watercolor (2005) on archival watercolor paper. 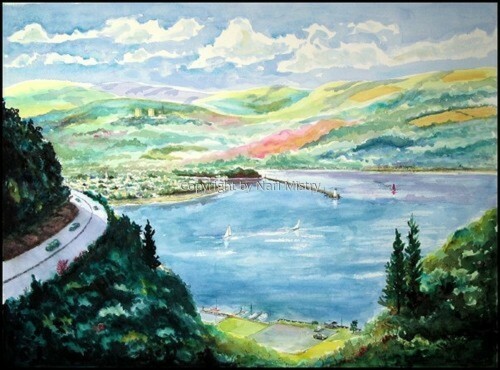 This scene shows a corner of Ithaca nestled amongst the hills at the head of Cayuga Lake. Commissioned by and in the collection of HeYun, Naperville, Illinois. Archival Giclee prints & Notecards available. Watercolor (2005) on archival watercolor paper. 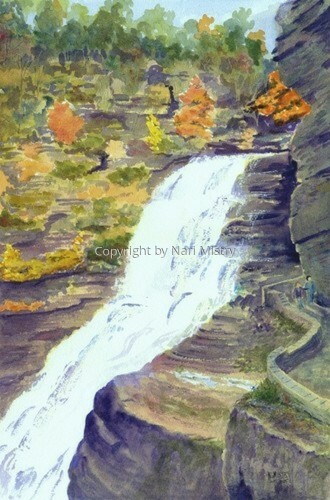 Here is a representational painting of one of Ithaca's major gorges and spectacular falls. 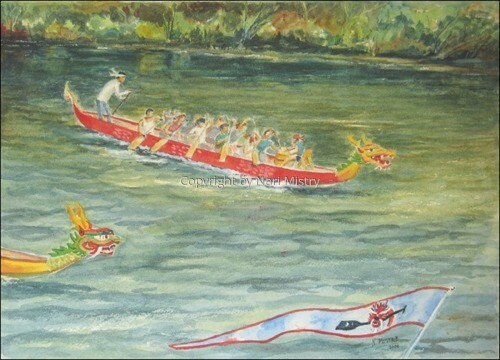 Watercolor (2006) of a brilliantly colored Dragonboat racing down Cayuga Lake Inlet during the 2006 Dragonboat Festival in Ithaca, NY. The Dragonboat logo waves on a penant. Venice! This impression of Venice has been in my mind ever since we were there in 1990. I was finally able to get it down on paper! Look carefully -- the stairs climb to nowhere, the bridge goes under the archway, the buildings glow with color .... That's the impression I have! Acrylic (2006) on archival watercolor paper. Archival Giclee prints and Notecards available. A Common Loon in full breeding plumage on Granite Lake in NH. 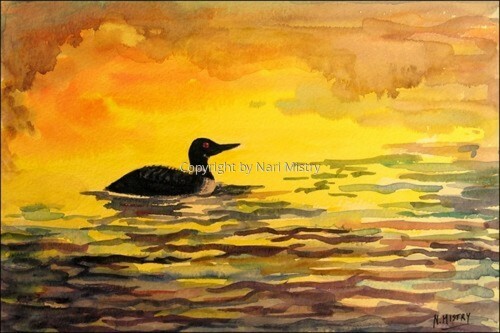 This image evokes an early morning view of a loon backlit with foggy brilliant sunrise colors. Watercolor (2006) on archival paper. The original is sold but a Giclee print may be ordered. This shows an Indian sailboat called a Dhow, a style which has existed for centuries. It is still used for carrying cargo across oceans! Watercolor (2004) on 140lb archival watercolor paper. I wanted to make a painting with almost pure colors and little detail. Watercolor (2004) on archival watercolor paper. Here are the namesake falls right in downtown Ithaca, NY. In the collection of Sonnary Phongsawath. Archival Giclee prints and notecards available. 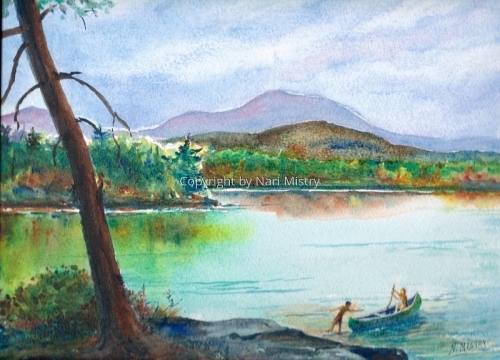 A quiet anchorage on Granite Lake in New Hampshire. Watercolor (2005) on archival watercolor paper. This is another "secret" waterfall that residents of Brooktondale village love to keep secret! Archival Giclee prints and Notecards available. Watercolor (2005) on archival watercolor paper. One of the many beautiful waterfalls in Ithaca. 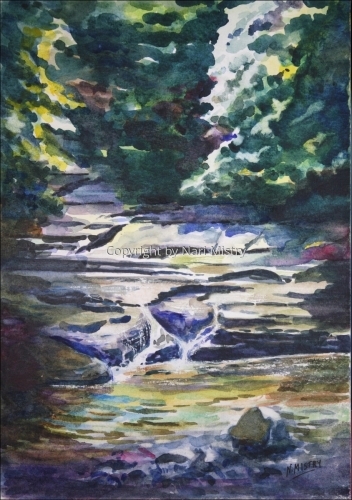 This one is a half mile below the main falls as the creek flows down the gorge to Cayuga Lake. Archival Giclee prints & Notecards available. Ithaca Falls bound in ice and snow! 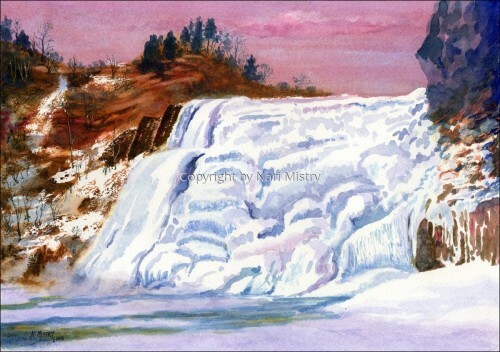 A wintry image in evening light of the namesake falls in Ithaca, NY. 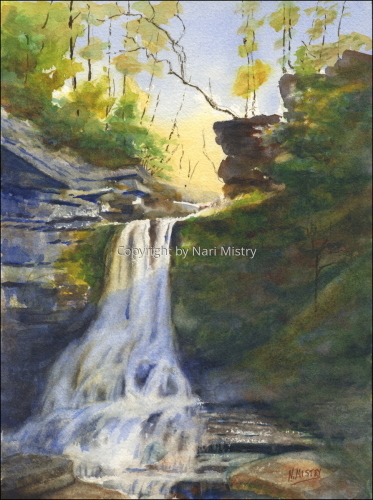 Look for the summer view of these falls in my "Ithaca Scenes" gallery. 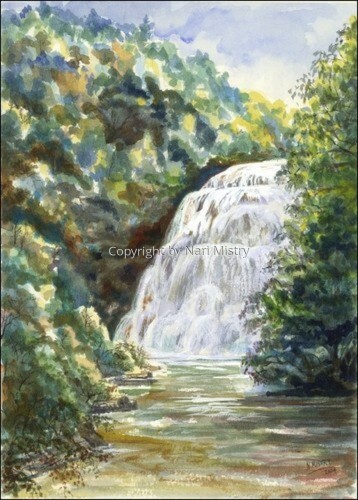 This painting was commissioned by and is in the collection of the Blomfields in Australia. 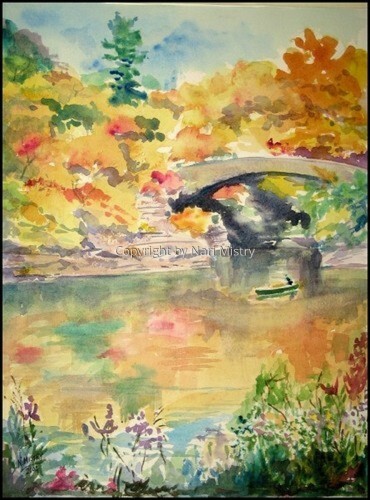 Watercolor on archival Arches paper (2008).